SOSOrinoco was established in early 2018 to shed light on the existing body of work, especially regarding the situation in the Amazonas and Orinoco regions of Venezuela, to raise awareness of the tragedy that is occurring, and to outline some urgent measures that need to be taken to halt the unfolding human and environmental disaster. The region South of the Orinoco River is remote, making travel difficult and dangerous. The Orinoco river basin covers a wide area — over 340,000 sq. miles, 76% of which are located in Venezuela — therefore, our team has had to rely heavily on satellite imaging to demonstrate the extent of illegal mining, as well as identify the deforested areas, and the resulting craters created by mining that are now ponds of mercury-poisoned water amid the Amazonian forest. SOSOrinoco has had the privilege of working with Radiant Earth Foundation, who has helped set up a workspace for the SOSOrinoco team on their platform, allowing analysts to examine and interpret satellite images of Venezuelan national parks and protected areas that are under severe attack by illegal mining. 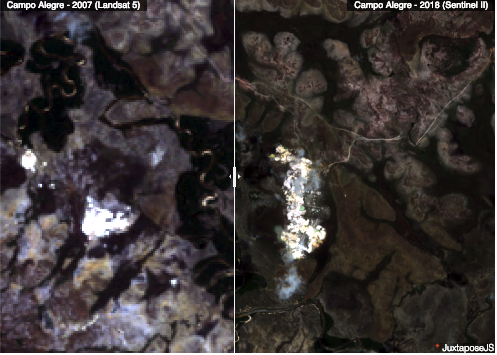 Radiant Earth has also been able to find satellite images that the SOSOrinoco team did not have access to. Thanks to cooperation with Radiant Earth Foundation, SOSOrinoco got access to an analysis of recent (2018) open data from the European Space Agency Sentinel-2 satellites, as well as access and analysis of high-resolution satellite images (2018) of Yapacana National Park. 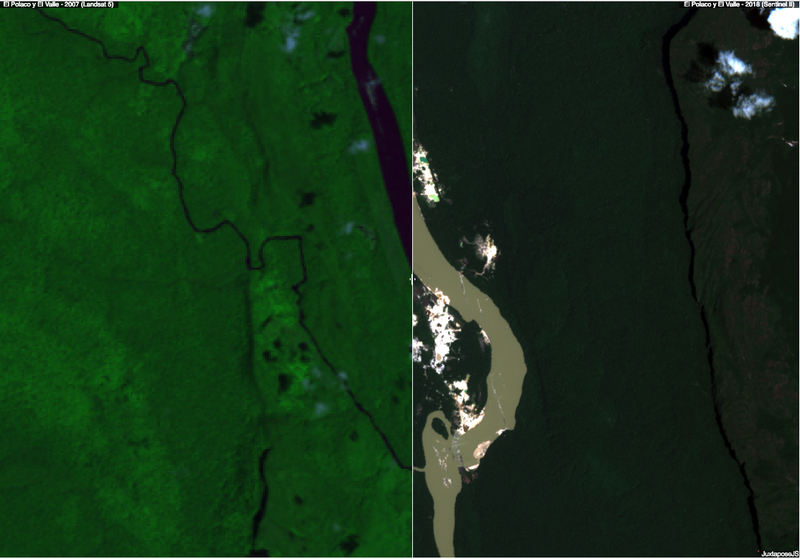 The high-resolution images, courtesy of DigitalGlobe, a Maxar company, revealed the accelerated pace of devastation and deforestation due to illegal mining inside the park. 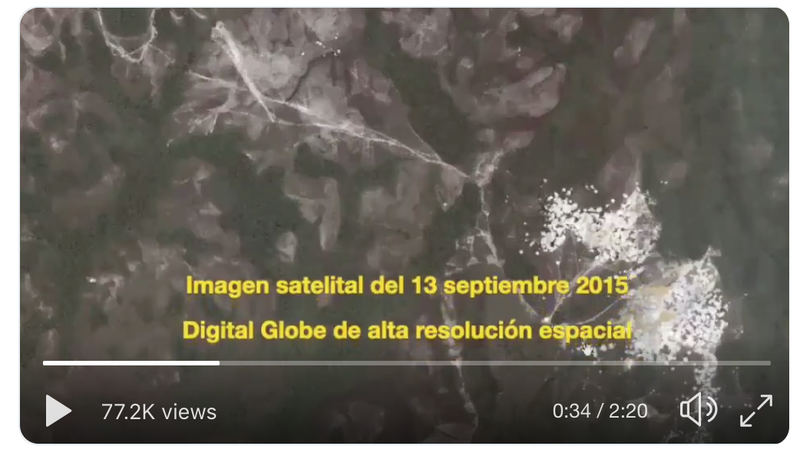 Once we obtained the satellite images, the SOSOrinoco team compiled short videos showcasing the analyses that have now gone viral on Twitter. While the rate of tree cover loss is increasing, awareness thereof is measured. However, the general public seems to be mesmerized by the short videos SOSOrinoco put together. We have found that by creating short videos that can be used on social media, we are very effectively educating journalists, politicians, activists and the general public. We have been told that foreign diplomats stationed in Venezuela now rely on our videos and images for up to date information on the illegal mining and environmental situation in Southern Venezuela. We have also used the images to do the popular #10YearChallenge on social media, in which we compare satellite images from ten years ago to those that we’ve been able to obtain the same place ten years later. SOSOrinoco has also, and very importantly, used satellite imaging in its in-depth reports that have been sent to UNESCO, IUCN, and other inter-governmental organizations that should know about the critical environmental situation occurring in Venezuela. Click here to see the change detection. Swipe left and right to see the expansion of mining in the Campo Alegre mine inside Canaima National Park. Click here to see the change detection. Swipe left & right to see the expansion of illegal mining in the El Polaco and El Valle mines (Canaima National Park). For more examples of our #10YearChallenges, view our latest newsletter. To understand the impact of SOS Orinoco’s work, read this Traveler Special Report by Kim O’Connell on Venezuela's Imperiled National Parks.